We designed the Walkslide to improve your life and sustain your healthy exercising habits without leaving your living room. Walksliding is EASY, FUN and SUPER effective! 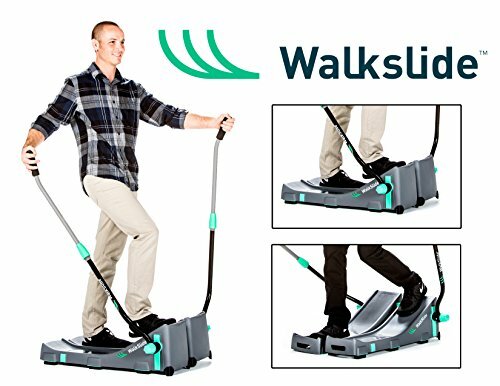 For kids, parents, grandparents or anyone looking for a low impact workout can Walkslide while watching TV, Gaming, reading, on your phone or even at the office! Everybody knows that walking is good for you. Not only does it improve muscle tone, coordination, circulation and joint mobility, but it also promotes mental/emotional health by causing the brain to release serotonin, which improves and stabilizes your mood. But finding the time for this regular exercise can prove immensely challenging. WalkSlide allows you to get workout in without missing a beat in your hectic daily life. You can park at under your work area, or use it while watching your favorite TV shows. And since it's uniquely lightweight and portable, the WalkSlide is the perfect exercise companion for business trips or vacations - even to places where there's no electrical power. How to use Walkslide: Use socks or slip walkslide booties over your tennis shoes. Stand in the center of each platform, grab handles for stability. Simply take a step with your foot, and it slides down the ramp, repeat with your other foot and you Walksliding in no time. How to use Walksldie Simply take a step with your foot using the included booties, and it slides down the ramp, repeat with your other foot and you Walksliding in no time. If you have any questions about this product by Walkslide, contact us by completing and submitting the form below. If you are looking for a specif part number, please include it with your message.